The Jack, Joseph and Morton Mandel Foundation has awarded a $5.25 million gift to Brandeis to fund a newly endowed faculty chair and strengthen the programming at the Jack, Joseph and Morton Mandel Center for Studies in Jewish Education. 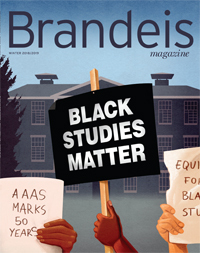 The foundation has a legacy of supporting Brandeis faculty and students, and encouraging the pursuit and dissemination of knowledge, particularly in the liberal arts and Jewish education. 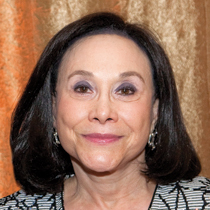 The gift was announced during a ceremony to dedicate the auditorium at the Mandel Center for the Humanities in honor of Barbara Mandel, P’73, Morton’s wife and a Brandeis trustee since 2005. More than 100 members of the Brandeis community attended the event, including students, faculty, senior administrators and trustees. 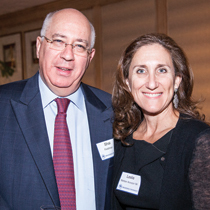 The latest Mandel Foundation gift to Brandeis establishes the Jack, Joseph and Morton Mandel Professorship in Jewish Education Research, complementing two other similarly named chairs in Jewish education (held by professor Sharon Feiman-Nemser) and Jewish educational thought (held by professor Jon Levisohn) at the Mandel Center for Studies in Jewish Education. Since its establishment at Brandeis in 2002, the Mandel Center has generated new knowledge and ideas, and designed innovative tools and frameworks that have helped transform the world of Jewish education. The center has pioneered research on the teaching and understanding of classical Jewish texts in a wide range of settings, as well as new models of professional education for Jewish educators. Thanks to one of the largest scholarship gifts in Brandeis history, generations of students will benefit from the generosity of Hans and Mavis Lopater. Brandeis undergraduates with a declared interest in English, American literature, history, European cultural studies, social sciences, psychology or women’s studies will be eligible to receive need-based support through the newly established Hans and Mavis Lopater Scholarship Fund. Hans, a Holocaust survivor who died in 2010, served as vice president of marketing research at Gillette for many years and worked as a corporate consultant. “We are overwhelmed by the generosity of Hans and Mavis, and thrilled that their legacies will live on through the Lopater Scholars,” says Myles Weisenberg ’78, vice president of development. Hans, a Brandeis Fellow, and Mavis generously supported the university for many years through gifts to the Annual Fund, the Tauber Institute for the Study of European Jewry and the music program. They were also charter members of the Sachar Legacy Society, composed of people who have included the university in their estate plans. President Frederick Lawrence is traveling the world for Brandeis. He recently met with students, alumni, parents and friends in India, Korea and China as he works to enhance the university’s global presence and ensure that Brandeis continues to provide a world-class education for international students. I often accompany the president on his travels, and I marvel at how deeply he connects with our alumni and friends. They appreciate his friendliness, authenticity, intellect and deep affection for Brandeis. Alumni have enthusiastically responded to President Lawrence’s call for our graduates to become more involved stewards of Brandeis. More than ever before, alumni are participating in Reunions and Alumni Association events, connecting with fellow alumni in person and online, and making gifts to the university to help today’s students. We will need the support of our alumni and friends as we implement Fulfilling the Promise: The Brandeis University Strategic Plan. Securing gifts for endowed faculty chairs as well as student scholarships and fellowships will be crucial to the success of the plan. At no time during my 20 years as the university’s senior vice president of institutional advancement have I felt so confident about Brandeis’ future. With your help, I know that our best days are ahead of us. 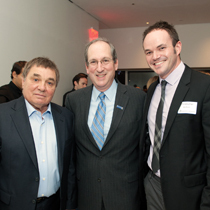 Chris Burden, President Frederick Lawrence and Chris Bedford. 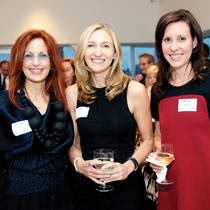 Dozens of alumni who are members of the Justice Brandeis Society, the university’s leadership giving circle, gathered at the New Museum in New York City to hear artist Chris Burden and Chris Bedford, the Henry and Lois Foster Director of the Rose Art Museum, discuss modern and contemporary art. 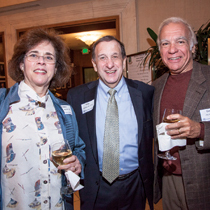 Ellis Landau ’65, P’91 (center), with Robin and Gary Jacobs, both ’66. 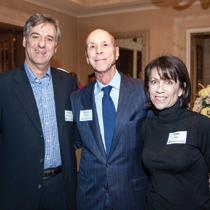 Trustees Leslie Aronzon ’84 and Michael Koss, P’96, hosted a dinner for the Los Angeles Friends of Brandeis at the Brentwood Country Club. President Frederick Lawrence moderated a discussion about developments in the Middle East with Shai Feldman, the Judy and Sidney Swartz Director of the Crown Center for Middle East Studies, and his Crown Center colleague, Khalil Shikaki. New England Patriots star quarterback Tom Brady joined the party to celebrate Brandeis’ newly renamed Myra (Hiatt) Kraft ’64 Transitional Year Program. Brady, who grew close to the beloved Brandeis alumna during his long tenure with the National Football League team, made a surprise appearance at team owner Robert Kraft’s home to meet approximately 60 Kraft TYP students and alumni. Robert Kraft, a prominent Boston businessman, and his family made a $5 million gift last year to rename the pioneering college-access program for Myra, a dedicated Brandeis trustee and supporter, who died in 2011. “She loved the school as a student. She loved the school as an alumna. She loved the school as a trustee,” says President Frederick Lawrence, who unveiled a portrait of Myra that now hangs in the Irving Enclave on campus. Former Brandeis trustee Stuart E. Eizenstat made a $250,000 gift to establish the Frances Taylor Eizenstat ’65 Undergraduate Israel Travel Grant, to give students the chance to have the same life-changing experiences in Israel that his wife enjoyed as an undergraduate 50 years ago. Through the endowed program, up to five Brandeis students a year will receive $2,500 stipends to fund their travel to Israel to study, pursue research or participate in internships. The university’s Schusterman Center for Israel Studies will administer the program. Fran, who died of complications from a stroke in February 2013, journeyed to Israel as a junior through Brandeis’ Hiatt Program. 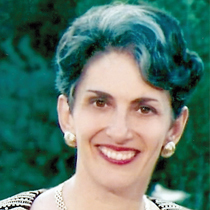 During her semester at Hebrew University, she developed a deep and abiding love of Israel that she transmitted to her family. She made repeated trips back to Israel, accompanied by Stu and their sons, Jay and Brian. For more information or to make a gift in support of the Frances Taylor Eizenstat ’65 Undergraduate Israel Travel Grant, contact JoAnn Leavitt, assistant director of the Schusterman Center for Israel Studies, at 781-736-2152 or jleavitt@brandeis.edu.